On April 10 2015 World Peace Initiative conducted a meditation workshop (Stress management and meditation) with Pattaya Expats Club. Invited by Daniel Schwartz, one of the club leaders, we arrived an hour before the meeting began and were treated to a breakfast. Some people came up and talked to us about meditation, the atmosphere was friendly and relaxed. After the opening of the club meeting and introduction, Kateryna Kulyk gave a presentation of WPI and its activities and spoke about ways of managing stress through inner peace. Members showed interest in both listening about and trying out this new method. The club was silent for over 20 minutes when around 30 members meditated together. After the presentation it turned out many of the club members were experienced in meditation and had been practicing it for years. 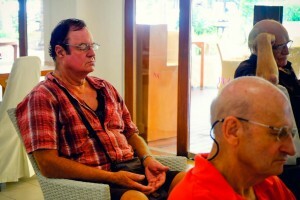 They shared experience and asked some questions about meditation and the method introduced. 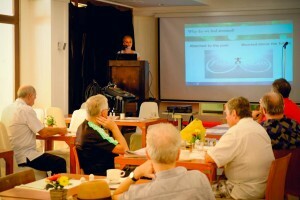 View Riddel answered questions and talked more about the meditation workshops WPI Foundation is planning to organize in the future in Pattaya. 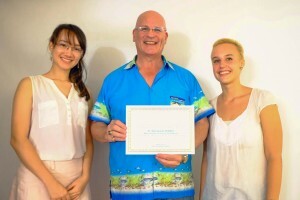 After giving the talk, Kateryna was interviewed by Pattaya Expats Club for Pattaya People Media group, giving some suggestions on how to avoid stress in daily life and how meditation can help with health, concentration and well-being.